It all began 11 to 15 million years ago. 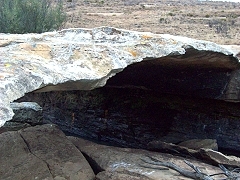 Water percolating down through various rock strata began to erode away less resistant layers of rock (silt strata) whilst more resistant layers of rock (sandstone strata) withstood this gradual process. All this time a sculpturing was taking place beneath the earth as if the powers that be knew there would be a need for what was being designed - South Africa's only natural-made bridge that crosses the Vaal River. 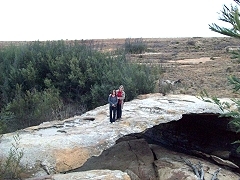 During their years of being driven away by the stronger tribes, San people migrating through this area used this natural bridge, as did the Zulus and Swazis. The Voortrekkers pulled their wagons over it and the English used it during their colonial occupation of Africa. So, through the centuries, it has been put to use by a myriad of tribes and people from all over the world who needed to cross the Vaal River during the rains. Today thousands photograph this natural phenomenon each year. Whilst you may only walk over the bridge in groups often or so, this precaution is simply to preserve a piece of natural history. It occurs about 18 km outside of Ermelo in the historically rich region, the Grass and Wetlands. This natural wonder is about 7 to 8 meters wide and approximately 27 to 8 meters in length.